Also today: Facebook will begin alerting users whose data was accessed by Cambridge Analytica. Mark Zuckerberg has a packed DC schedule to start the week. 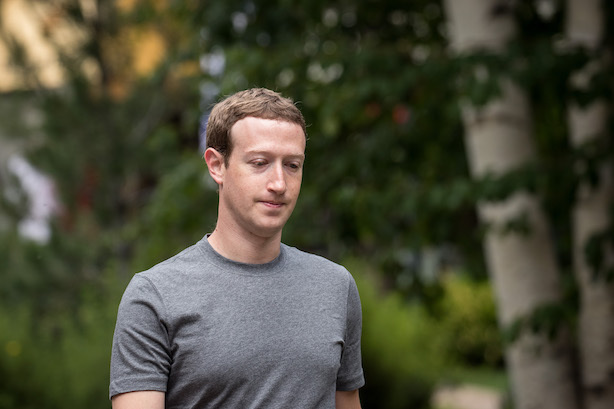 The Facebook CEO is set to meet with lawmakers on Monday, a day before he’s scheduled to testify in front of a joint House-Senate committee hearing about 2016 election interference and his company’s use of customer data (Reuters). Watch for cues from legislators about any willingness to take on the complicated task of regulating social media (Wall Street Journal). Facebook is also alerting the 87 million members whose data was pulled by Cambridge Analytica starting on Monday. The social network will publish a link at the top of users’ news feeds allowing them to see what apps are connected to their accounts and what information they may have accessed (CNN). Facebook also suspended third-party analytics platform CubeYou this weekend for Cambridge Analytica-like behavior (CNBC). Another headache for Facebook: It’s losing the support of boldface names. Social media stars such as Ryan Hamilton are warning, "No one trusts Facebook" (New York Times). Apple cofounder Steve Wozniak has also dropped the platform over its handling of user data (USA Today). Facebook isn’t the only tech giant with data-gathering headaches. Activist groups are claiming YouTube has violated privacy laws by gathering information about children. Twenty organizations are set to file a complaint with the Federal Trade Commission on Monday claiming the Google company "has made substantial profits from the collection and use of personal data from children" (CBS News). Michael Anton is planning to leave the White House. The National Security Council spokesman was one of President Donald Trump’s earliest and most ardent defenders (Politico). In other politico people moves, Karen Hinton, New York City Mayor Bill de Blasio’s former top spokesperson, is planning to set up her own communications shop (New York Daily News).